New digital billboard going up Oct. 29 at Westwood and Santa Monica Blvds. 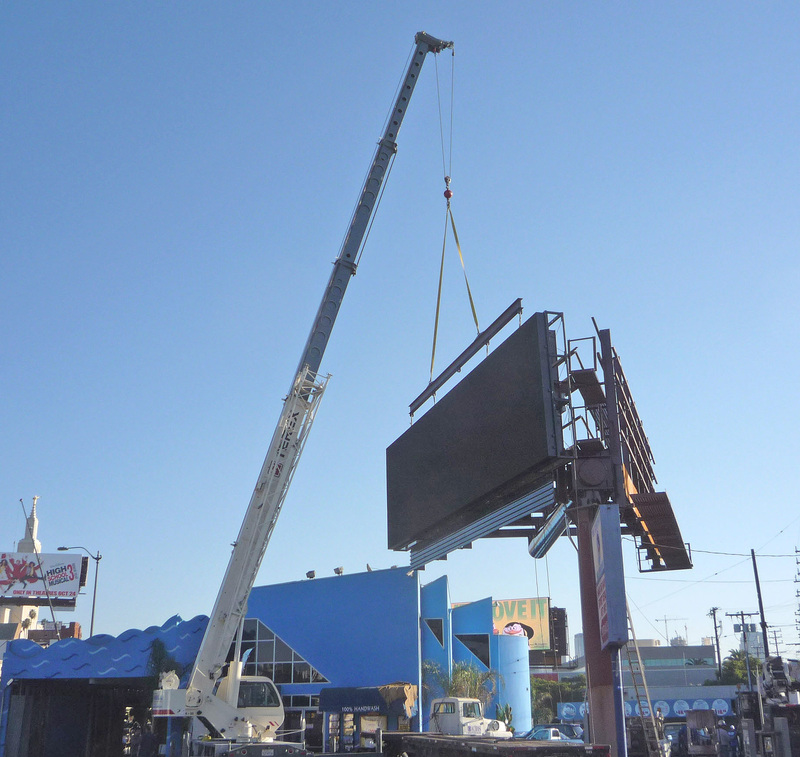 An Interim Control Ordinance (ICO) putting a one year moratorium on all new off-site advertising signs, including the conversion of conventional billboards to digital, is expected to be considered the by the City Planning Commission sometime next month. However, two major downtown developments—Sonny Astani’s 33-story “Concerto” condominium project, and the L.A. Live project adjacent to Staples Center—are already seeking to be exempted from any moratorium on new signs. The commission unanimously voted last week to direct the city planning department to draw up the ICO, including a range of alternative criteria for the granting of exemptions, and to report on the number of billboards and other off-site signs that might be subject to exemptions. 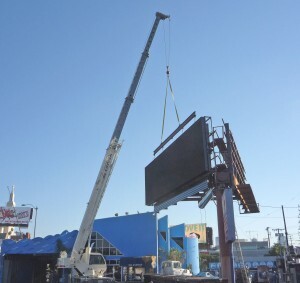 Astani is seeking approval of a special sign district to allow a 14-story animated sign, while various forms of electronic advertising signage have been proposed for L.A. Live. Giving the city authority to order the cessation of hazards posed by billboards to pedestrians and motorists, including the shutting down of night-time illumination. Raising the city permit fee for new billboards, or levying a billboard tax to fund a citywide anti-blight or urban environmental restoration fund. Such a fund would not be council district-based, in order to avoid creation of any incentive for council members to seek new billboards as a way to pay for services or amenities in their districts. Convening a roundtable of experts to advise the commission on pedestrian and driver safety issues raised by emerging advertising technologies, on the implications of outdoor advertising for murals and public art, on concerns regarding energy consumption and light pollution, and on threats to street trees pruned or cut down by companies seeking to enhance the visibility of their billboards.